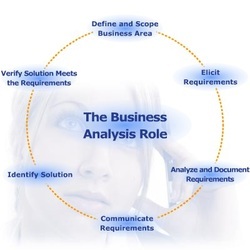 Business analysis is the process of identifying business needs and determining solutions to business problems. Business analysis techniques are applied to develop an appropriate plan and then put it in to action. Business analysis can be implemented to set goals, and to achieve them. These goals will cover strategic business practices encompassing IT, business processes, and corporate policies. Usability is the ease of use of a system or a website. It is a quality attribute that assesses how easy user interfaces are to use. If users either find a system difficult to use or find problems with it, then user adoption of this system is going to be extremely difficult. Usability is a necessary condition for survival. If a website is difficult to use, people leave. If the home page fails to clearly state what a company offers and what users can do on the site, people leave. If users get lost on a website, they leave. If a website's information is hard to read or doesn't answer users' key questions, they leave. For Intranets, content management systems, web portals usability is a matter of employees productivity. Time users waste being lost on your intranet or pondering difficult instructions is money you waste by paying them to be at work without getting work done. If it is a customer serving or e-commerce website, it is a lost sale. User-centered design (UCD) is the foundation of usability. It is a design philosophy and a process in which the needs, wants, and limitations of end users are given attention at each stage of the design process. To learn more, please call us at (650) 474-0955.